Ever print something from a website and find that some of the page has been cut off or the URL is printed across the bottom of the page? 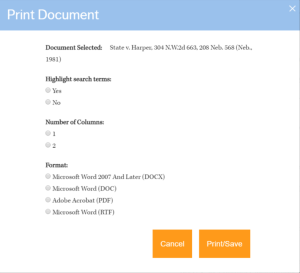 Fastcase allows you to print clean, single or dual-column Word or PDF documents. 1. Once you’ve found your case, hover over the white folder in the upper-right corner and click the Print link in the dropdown menu. 2. Choose whether to highlight your search terms, and set your preferred number of columns. 3. You can also choose whether to print the document from Microsoft Word or Adobe Acrobat in the Format section. 4. When you’ve selected all your preferences, press Print/Save and your document will open in the program of your choice. 5. From here, you can print it right away or save the document to print later.